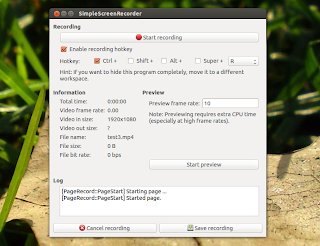 SimpleScreenRecorder is a Qt screen recorder for Linux which, despite its name, comes with more features than other similar tools. The application is very easy to use and the default settings should be enough for most cases, so usually you won't need to change any settings. Using it, you can record the entire screen (with multi-monitor support), record a fixed rectangle, follow the cursor or record OpenGL applications (can be used to record games). Please note that OpenGL support is currently experimental and it might be buggy for now or it may not even work at all for you. Furthermore, the application tries to capture the frames before they are displayed on the screen and this might be considered a hack in some games and you might be banned so check if you're allowed to record a game before using this feature. For other Linux distributions, get the source code via GitHub.